Two artists essays I wrote appear in the online catalog for the phenomenal show, Come Together: Surviving Sandy. A big thanks to my former SVA professor, Thyrza Nichols Goodeve, for the opportunity to participate in this project. Pellizzi’s installation title is taken from the late 19th-century French novel,Le Rouge et le Noir, by Stendhal, where the protagonist must choose between the two dominant seemingly disparate social spheres of his time: the clergy and the army. Cleverly, Pellizzi draws a similar correlation between Stendhal’s proposed dilemma and the choices artists’ face today. Who or what are artists to pledge their allegiance —the market or the academy? To animate this dialogue, Pellizzi erected shiny walls, drenched in a brilliant shade of vermilion, reminiscent of the hue present on traditional Shinto temple torii gates. The walls act as a shell that hides the existing structure of the gallery space, creating a room within a room. 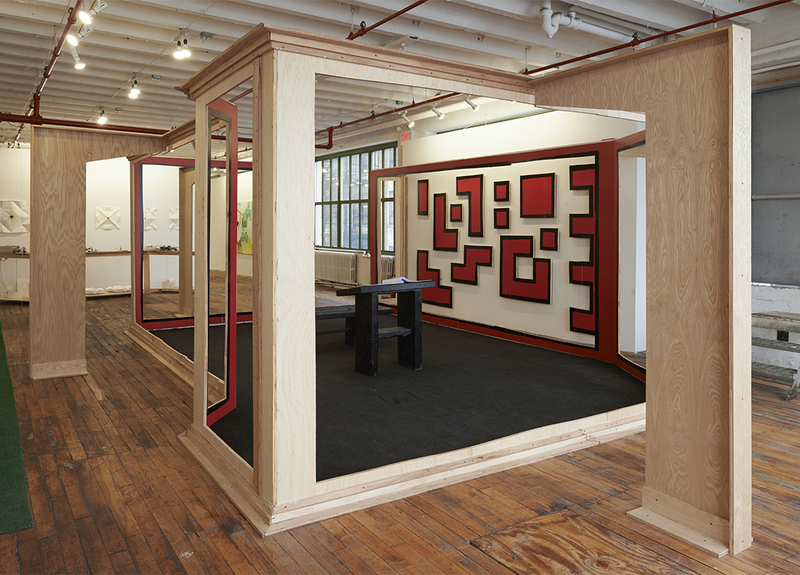 After the artist completed the construction of the walls, he offered them up for sale at the going rate per square footage on the Lower East Side real estate market, where the exhibition occurred. The collector determined the slick black marks Pellizzi painted on the wall’s surface that divided each selected and sold plot. They were then required to disclose their identity on a ledger placed openly in the center of the installation. With this final step, the art process, from production to final sale, is played out to completion. There is something on the move. It’s a total grey-out; a haze of billowing fog clears to reveal a shapeless form. The form appears to have two wispy arms, and at the end of each arm there are hands that gesture with charismatic force. The form is active and airy, and it weightlessly hums and drifts on the canvas like a jellyfish. Pushing out to the front of the form is an oblong, smoky face. A red, hollowed-out mouth playfully overcomes the face’s surface and the mouth is filled with a set of ten rotating disks for teeth. Do you want to know the craziest thing about the teeth? They double as eyes. Juan Gomez, “Mawinzhe,” 2013. Oil on canvas, 7 x 11′. Courtesy of the artist. Photo by Zack Garlitos. Mawinzhe (2013), Colombian born Juan Eduardo Gomez’s whimsical contribution to Surviving Sandy, is a reminder of painting’s potential for exuberance. The 84-by-132-inch oil painting is fleshy and animated, and Gomez’s brush strokes are at once vigorous and carefully placed; the long smooth marks are self-assured and transformative. There is a tension present in the work; it feels like the subject is at odds with itself, each part pulling the work into two separate directions. The work offers a glimpse into an in utero place between the abstract and the figurative, an active space, where the subject is unfixed, vague and suggestive. Mawinzhe is a visualization of what it must feel like to be in the state of becoming, on your way to something else. It presents an unfamiliar form as it’s subject is caught in an act of disappearance; it is an awakening. In the end, the whole of Mawinzhe plays out like an apparition and conjures fellow painters who made with similar off-kilter vision: Bacon, de Kooning, Lassnig, and Dunham, all artists who set scenes and began open-ended wild narratives on canvas, odd, and sometimes dark. Brooklyn-based Gomez began his career by showing abstractions, but buzzing in the background of his painting practice was what he considered the more personal practice of figuration. He was reluctant at first to show these works, considering them too private for public view. However, the work didn’t stay in the background for long. When a curator selected some of these works for a show, the important relationship between the two seemingly separate creative spaces he occupied came forward in the public representation of his work. 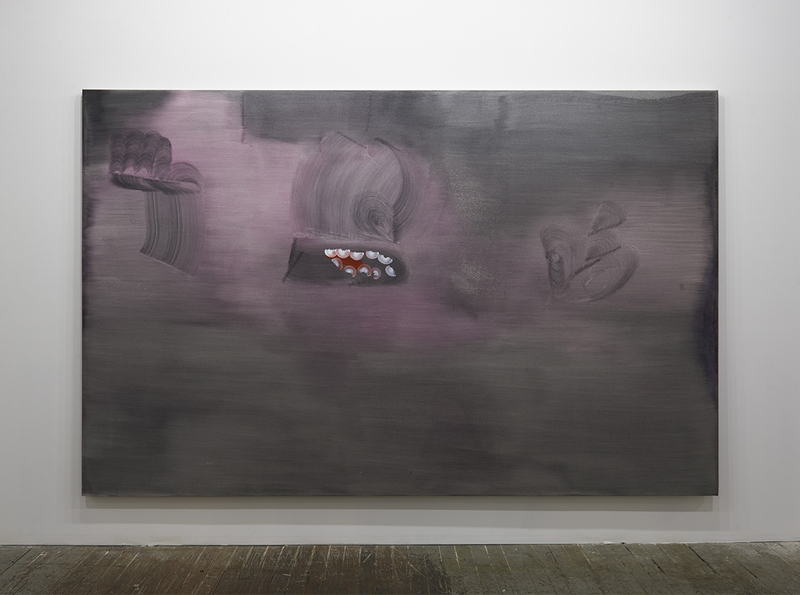 Gomez considers both abstraction and figurative work as two critical components to his making. “Having a balance between the two has been my focus. One is just as important as the other. Sometimes figuration allows me to study people’s behavior and mannerisms: there I find a narrative element that interests me,” the artist declares on his website. In Mawinzhe, Gomez has found a space where his interests, abstraction and figuration, coexist with compelling results.